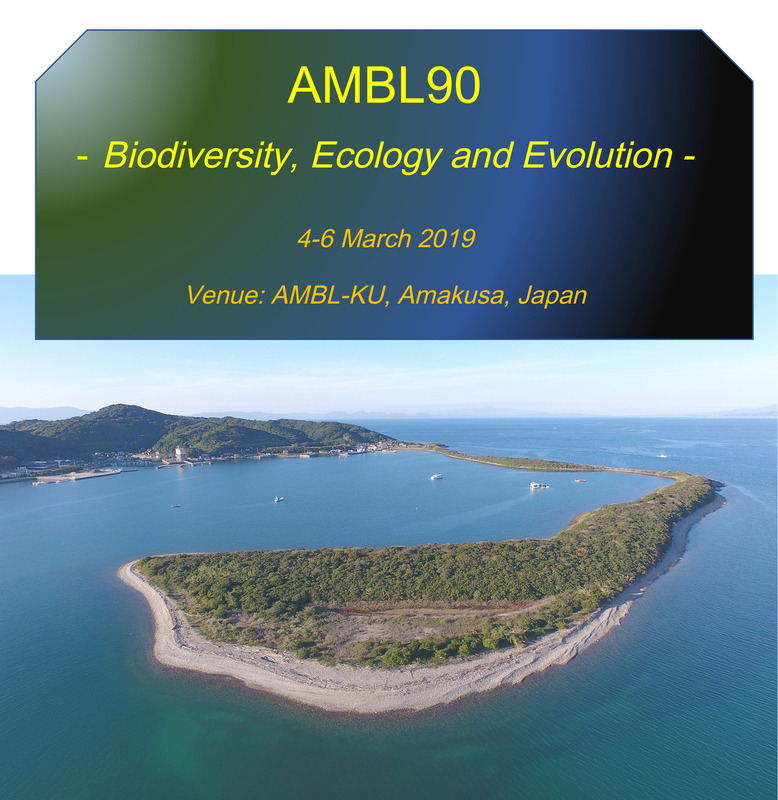 AMBL90, an international symposium organized by the AMBL-Kyushu University, in collaboration with SCESAP, the Society for Coastal Ecosystems Studies - Asia Pacific, will be on 4-6 March 2019. IMPORTANT - watch out for the publication plan - there may be changes in procedures ! Tokeshi dived in Reihoku on 25 Nov: water temp 19 'C. Watch out for Travelling updates (access info) below. Delegates from Japan: please inform the Secretariat when and how you intend to travel (i.e., from Fukuoka to Amakusa). Delegates from outside Japan: please inform the Secretariat of your flight details and how you intend to travel from Fukuoka. Symposium bills have been dispatched to delegates. The Secretariat has now placed in operation their 'food management team'; we are checking all the menues offered during the symposium; one of the decisions already made is the exclusion of pork from virtually all symposium meals. We are pleased to announce that Dr S Nojima, the longest-serving staff of the AMBL, is now fully involved in helping the symposium participants. Well over 100 delegates already registered. Delegates from outside Japan : If you require an official invitation letter for visa application, please contact the secretariat (Prof M Tokeshi, tokeshi(at mark)ambl-ku.jp), indicating your full name (as it appears on your passport), nationality, date of birth, current position, and postal adresses (both workplace/home). If you need to submit a symposium schedule, download and print the 2nd circular pdf below. If you need to indicate accommodation on a schedule sheet, put "AMBL - Kyushu University, contact tel. 0969 350003 ; Activity: participation in scientific meeting ". Good news: The secretariat is happy to announce that student presenters travelling from outside Japan will be considered for partial financial assistance towards accommodation costs, subject to the travel cost being covered by the delegate himself/herself or by other fund(s). This being said, delegates should be prepared to demonstrate, at the time of entry into Japan, that they have sufficient financial means to cover all the costs of staying in Japan, as the financial assistance mentioned here will not be forthcoming until the delegates reach the Amakusa Marine Biological Laboratory in Reihoku, Kumamoto. In other words, this support will become available posterior to entry into Japan. Non-Japanese students and researchers currently studying/based in Japan and in receipt of a scholarship/fellowship are required to pay the fee above. 30 November 2012 - - - - Delegates arrive. Registration. Where an excess number of oral/poster presentations occurs, a shift to the other format may be requested. Delegates are recommended to make an early registration. Oral presenters : PowerPoint2007 (Windows) will be mainly used. The presenter will himself/herself operate the remote controller. Mac Users please check their file on a Windows machine. Please bring your presentation in a USB stick and hand it over to the secretariat at the time of reception. Better still, if you can, send the material by e-mail to Prof Tokeshi; the earlier the better. Time your presentation to less than 15 min (unless otherwise instructed by the secretariat), in order to avoid being suddenly 'cut off'. Poster presenters : A0 size or smaller, portrait. All materials to be prepared in English. There will be a best-oral/poster competition for student presenters. Symposium participants will have an opportunity to join one or more of field workshops, the transport for which will be arranged GRATIS by the conference secretariat. These will include (1) Reef assemblages of southern Amakusa, (2) Rocky and stony shores of northern Amakusa, (3) estuarine habitats of Hondo/Yokaku Bay, and (4) Dredge sampling in Tomioka Bay (including sandy, algal and seagrass beds)(subject to demand). In the case of scuba-diving, costs of air tanks and other diving equipment need to be covered by the participants; please do not forget to bring your own c-card. Field workshops are subject to sea/weather conditions. Field workshops may also involve indoor sessions on some methodological aspects of research, depending on participants' interest. At the time of registration, participants are asked to express their preferences. There are four categories of accommodation, which offer a considerable value for money for the symposium participants. Delegates are reminded to apply early, as these will be offered on a 1st come-1st served basis. If one category of accommodation is exhausted, the next most economical option will be arranged. Transport between the chosen accommodation and the venue will be arranged by the symposium secretariat. 3. Japanese-style inn (single occupancy) --- 4500-5000 yen. ::::::::::::::: This is an exceptional value for money for economically-tight students, offered only as an inclusive package of 5nights/6days with breakfast, at 8000 yen. Lunch : It is strongly recommended that delegates pre-order lunch during the symposium, as this is quite convenient and competitively priced (600 yen). Symposium dinner (2 December) is a not-to-be-missed event, as the secretariat is taking full responsibility of its organisation including the selection of best quality food, french wine, and more --- : 5000 yen inclusive of drinks. We are confident that no other conference dinner in Japan can match our cost performance. Apart from the symposium dinner, we have arranged dinners on other nights as well, because eating opportunities are otherwise restricted. Our dinner options are good values for money and the quality is guaranteed with fresh local (marine and terrestrial) products. Expected cost c.1500 yen each without drink. Highly recommended; you will not regret these. Apart from presenting their works at the symposium, all participants are also invited to submit their papers for publication in a special issue of Hydrobiologia (IF=1.96), subject to normal peer reviewing. Papers covering any topic that impinges upon the symposium theme, including ecological and taxonomic aspects, are welcome. In this respect, we regard the term 'subtropics' broadly as encompassing, for example, areas affected by the warm Kuroshio current and its derivatives, including the southern half of Japan and Korea. Therefore works involving all tropical /subtropical / warm temperate waters of Asia are welcome in this symposium. Papers for publication are to be submitted after the symposium, by mid January 2013. While symposium presentations will be made in a congenial, 'relaxed' manner, papers for publication will be rigorously reviewed and there will be no guarantee of eventual publication unless the expected quality is met. For formatting your manuscript, please refer to the journal site. It is important that prospective authors should strictly follow the submission guidelines (e.g. abstract limited to 150-200 words, Results and Discussion should be separate, style of references, etc). The actual publication will be expected towards the end of 2013. Money Exchange is available only at the Fukuoka Airport International Terminal, 2nd Floor, until 15:00. Note that bank cards issued outside Japan are nearly unusable to withdraw cash at Japanese ATMs. Make sure you have Yen before you leave the Fukuoka Airport or, better still, your home country. Please assume that there is no foreign currency exchange service in Amakusa. Japan is a 'cash' country par excellence and you will certainly get stuck without yen !! Amakusa Airport is reached in 35 minutes by the Amakusa Airline (AMX) from the Fukuoka Airport with international connections to most Asian destinations. If you arrive at the International Terminal of Fukuoka Airport, take a free shuttle bus connecting terminals and go to the Domestic Terminal No 1 where the Amakusa Airline counter is. You have to allow at least 1.5h between your international arrival and Amakusa Airline flight, as your immigration may take time. Flights from Fukuoka to Amakusa are at 09:00, 16:40 & 19:00. Transport from the Amakusa Airport to Reihoku will be provided by the secretariat, if arrival notices are received in advance. Return flights to Fukuoka leave Amakusa at 08:00, 15:40 & 18:00. Cost:12800 yen each way. You can book your Amakusa Airline flights by calling +81 969 341515 and asking for English-speaking staff (everyday 09:00-18:00 Japan Time only). Be patient and speak slowly. Tell them your desired date and flight, your surname (spell it out clearly) and age. You will then be asked for your credit card information (pre-payment by VISA, MASTER, JCB or AMEX is necessary). It is then simply the matter of turning up at the airline counter and declaring your name and booking number (there is no e-ticket). Alternatively, you can ask the secretariat to do the booking for you, providing you are happy to give us information on your age and credit card details. Unfortunately, the airline web page is in Japanese only and its internet booking system is unusable unless you are well versed in the language. An alternative way of travelling is an epic overland journey (6 hours !) that consists of three separate journeys: (i) Fukuoka to Kumamoto, (ii) Kumamoto to Amakusa (Hondo), and (iii) Hondo to Reihoku (AMBL). The whole journey cannot be completed unless you depart early from Fukuoka. From Fukuoka Airport to Amakusa (Hondo) via Kumamoto, you can take the frequent Express Bus service (leaving at 2 minutes past every hour, 9:00-17:00, and 32 min after 15:00-16:00) which takes 5 hours altogether to Amakusa (Hondo) (excluding the time needed to change the bus at the Kumamoto Kotsu Center). However, this option is recommended only if your flight reaches Fukuoka at 12:00 or earlier - if not, you are unlikely to be able to reach the AMBL by the evening using the bus. It is recommended that you choose a flight that arrives in Fukuoka by midday, if possible. If your flight arrives in Fukuoka after 15:00, you will have to pass the night in Fukuoka or Kumamoto /Nagasaki (unless you take the Amakusa Airline, see above). Travelling on the 29th rather than the 30th would alleviate the problem of reaching the AMBL at the reception time on the 30th. See below for what to do if your flight is scheduled to arrive in the afternoon of the 29th. If it's in the afternoon of the 30th, our recommendation is to go for a Amakusa AIrline flight. If you are unsure, you should contact the secretariat with details of your flights as soon as you have the info. For the bus journey, you have to get the discounted 'through-ticket' from Fukuoka to Amakusa (Hondo) (cost: 3500 yen, one way, cash payment only) at the bus ticket counter located inside the arrival hall of the International Terminal building (or outside the Domestic Terminal 2). This combi-ticket (you shout "Amakusa-Hondo-madeno-kippu onegai shimas ! " at the counter) is cheaper than buying two tickets separately for Fukuoka -(2h)- Kumamoto, and Kumamoto-(2.5h)-Amakusa (Hondo) journeys. So the first leg of journey is: Fukuoka Airport (Highway bus stop No 3 outside the arrival hall of the International Terminal, or outside the Domestic Terminal 2) - Kumamoto (get off at the final destination, Kumamoto Kotsu Center "Bus Terminal", Make sure that you give away only the Fukuoka-Kumamoto portion of your ticket and retain the other half because you need it for your second leg of journey - easier to show the driver the whole ticket when you get off the bus. Go into the Bus Terminal and check the next bus to Amakusa. You take a new bus from the Bus Stop No 7 to Amakusa (Hondo + Alegria Gardens Hotel). The secretariat recommends that, on 30 November, when you change the bus at the Kumamoto Bus Center, take the 13:00, 13:45, 14:30, 15:15 or 15:50 service to Amakusa (Hondo & Alegria Gardens Hotel) and get off at Hondo Bus Center (not the final stop). We can then pick you up at the Amakusa Hondo Bus Center at 16:00 and 18:05. If you travel on your own, from the Hondo Bus Center, another bus ride to Reihoku/Tomioka (AMBL) would take c. one hour (c. 870 yen) - this is a very limited service and virtually unavailable in the night. Additional pick-ups at Hondo bus center: 19:35, 20:15, 21:35 and 22:30 (please allow 20-30min waiting time, as our transport capacity will be completely stretched on the 30th). If your flight is scheduled to arrive in the afternoon/evening of the 29th, the best (i.e., most convenient and economical) option is to get on the bus as described above from the Fukuoka Airport and travel to the Kumamoto Bus Center (the last bus from Fukuoka leaves Fukuoka AP at 22:32). There is a hotel inside the Bus Terminal ("Kumamoto Kotsu Center Hotel") where you can pass the night. The next morning, you can make a sightseeing tour of the impressive Kumamoto Castle (entrance fee: 500 yen), by asking the hotel receptionist to keep your luggage and taking a 10-min walk to the castle. 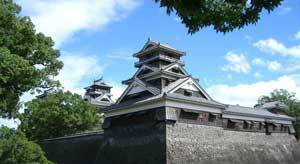 After the sightseeing, you return to the hotel by midday and continue the bus journey to Amakusa (Hondo). You can make your hotel booking by writing to e-hotel(at)kyusanko.co.jp, clearly indicating 1. your surname, 2. contact e-mail address and phone number (your cellphone will do), 3. desired date, 4. single/twin, 5. smoking/non-smoking. Price is approximately 100 USD. PLEASE also send this booking request (as Cc.) to the secretariat so that we can trace it, should problems arise. Hotel telephone number: 096-326-8828. Another route, a bit more adventurous (especially if you haven't travelled in Japan before) one, is via Nagasaki. From Fukuoka Airport, take an express bus service to Nagasaki bus center (2h), from which a local bus to Mogi port (0.5h) is taken. From the Mogi port, a fast boat (less than 1h) will take you to the Tomioka port in Amakusa, which will leave you with just a 7-min walk to the AMBL. There are 4 services of boat, departing from Mogi at 7:20, 10:00, 13:30 and 17:00. The total cost is around 4500 yen. If you take a taxi from Nagasaki to Mogi port (" Mogi koh" in Japanese) (to avoid taking a local bus, which may be a bit tricky), the total cost would be c. 6000 yen. Private car/rent-a-car is a valid, convenient option if you can drive in Japan. Of course, either a Japanese or an international driving licence is a must for this. We have a plenty of parking space. In case you may encounter problems on the way, the secretariat will operate a hotline on the 29-30 November, 09011944734 (Prof Tokeshi, this telephone number will be available on these dates only). To use a public telephone, (1) lift up the receiver, (2) insert several 10 yen coins, a 100 yen coin or a telephone card (pronounced as "tele-hon kaado") which can be purchased at convenience shops, kiosks and vending machines, (3) dial the number. Copyright (c) Amakusa Marine Biological Laboratory. All rights reserved.